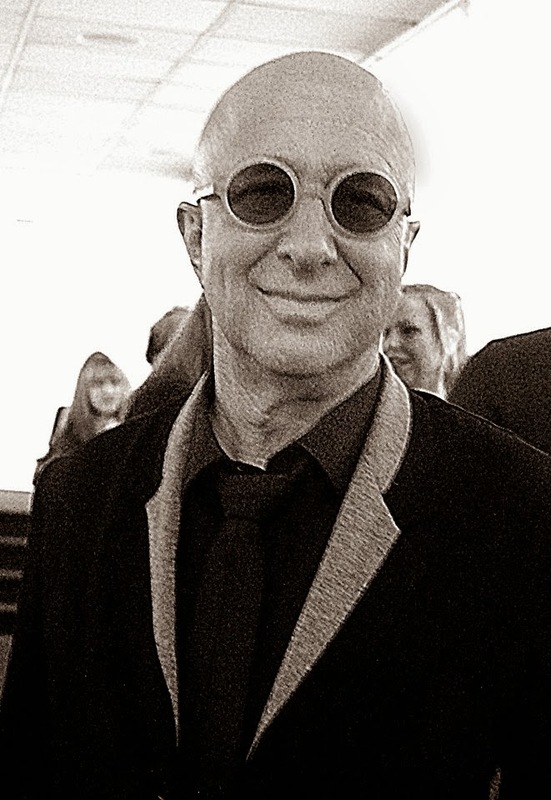 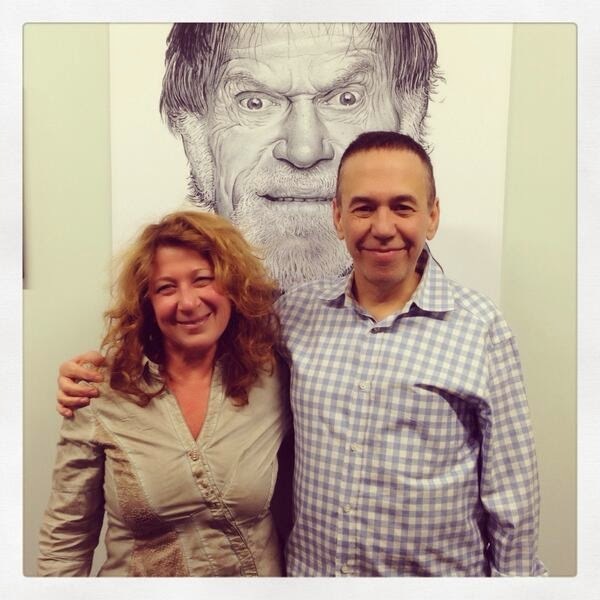 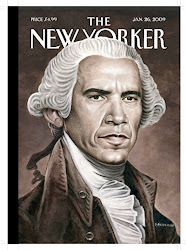 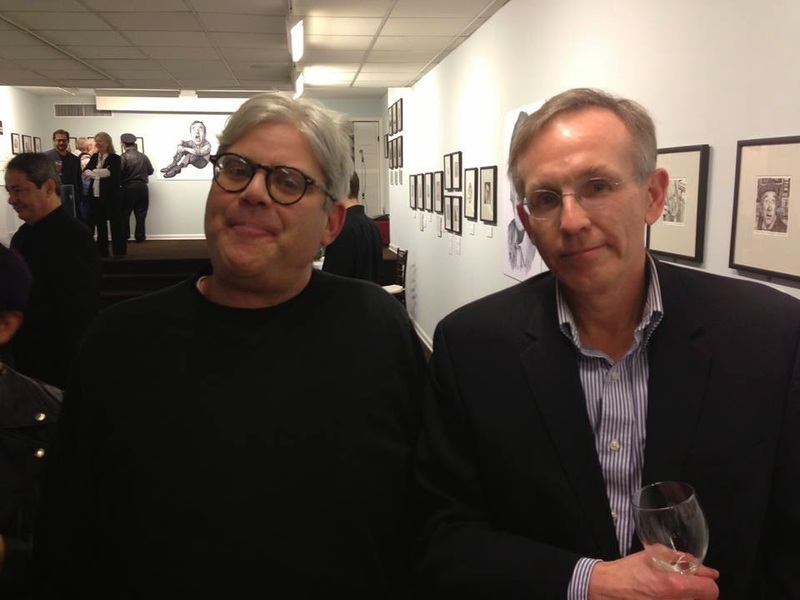 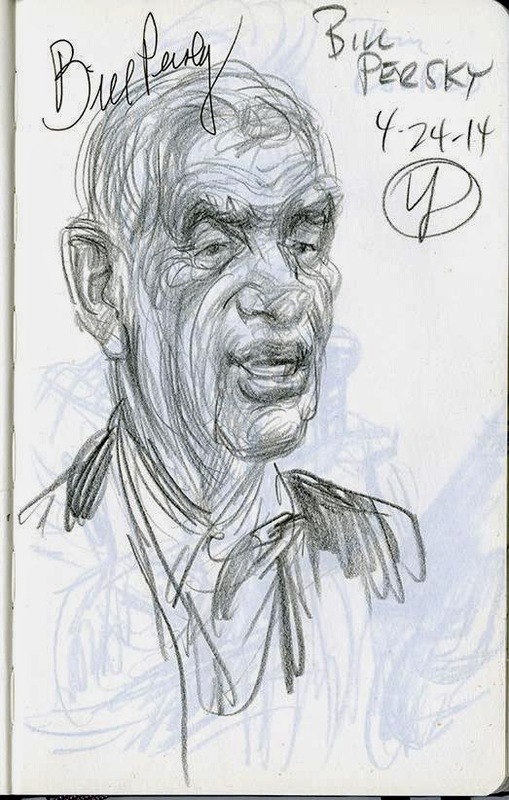 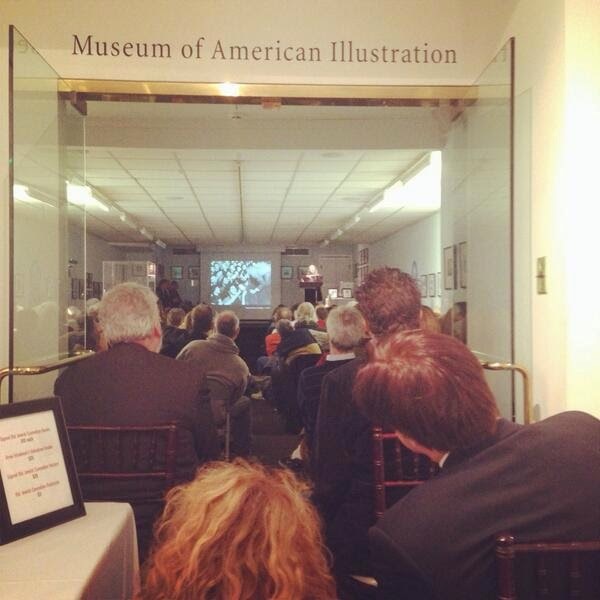 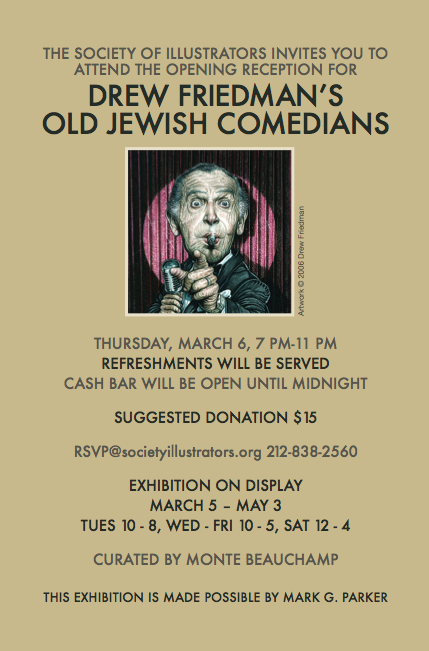 My Old Jewish Comedians Show at the Society of Illustrators, a recap. 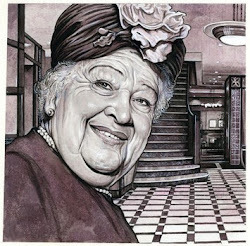 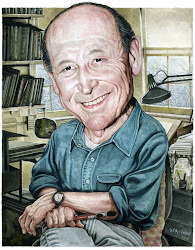 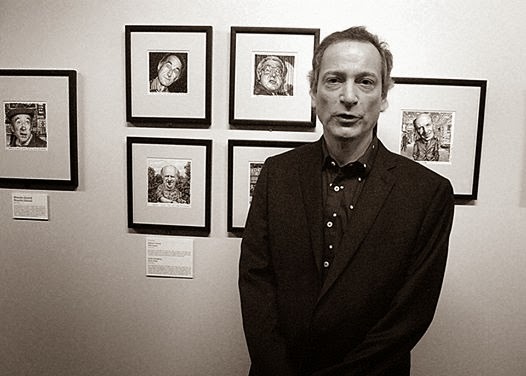 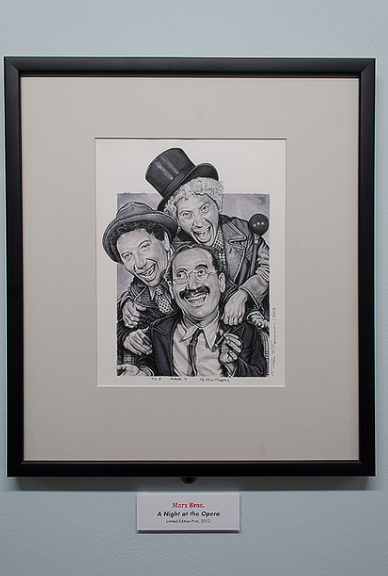 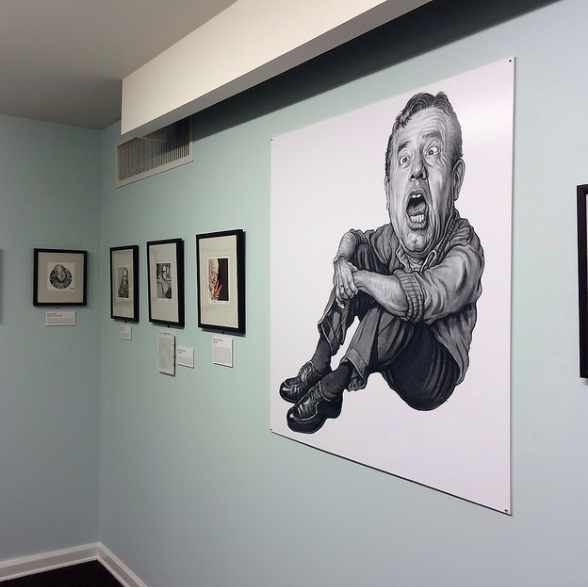 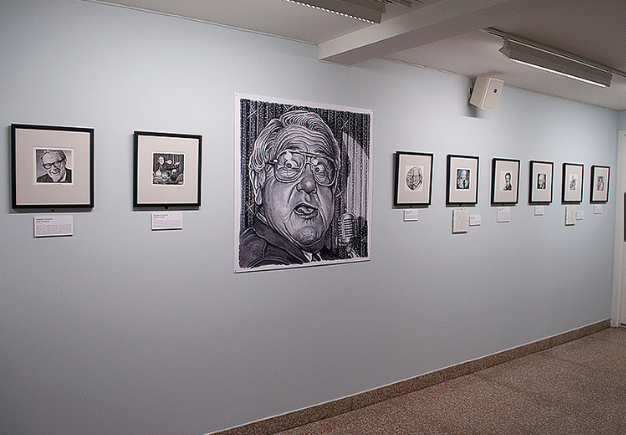 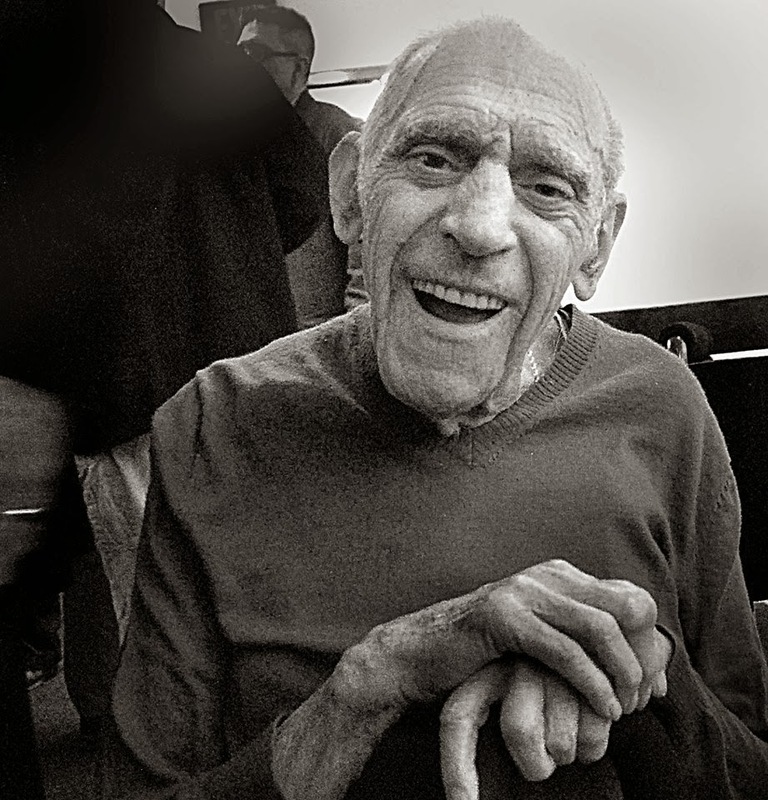 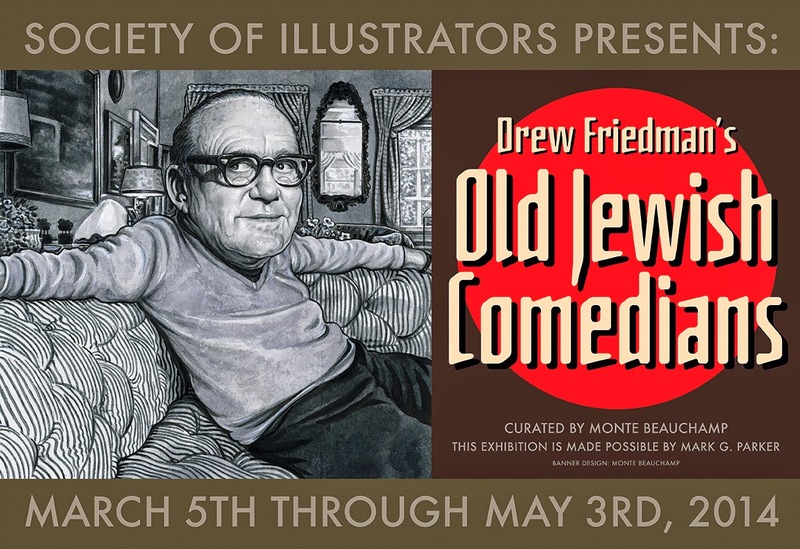 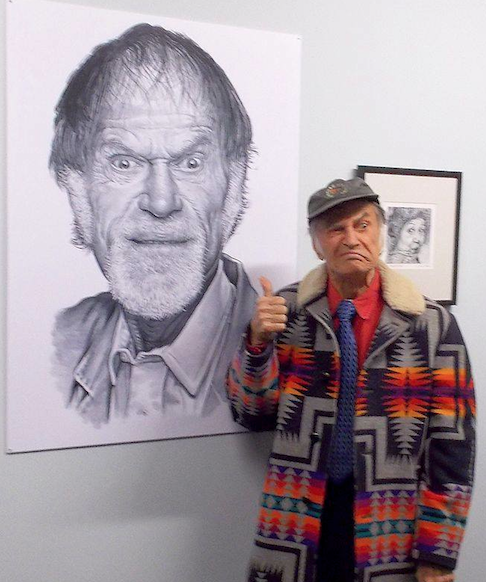 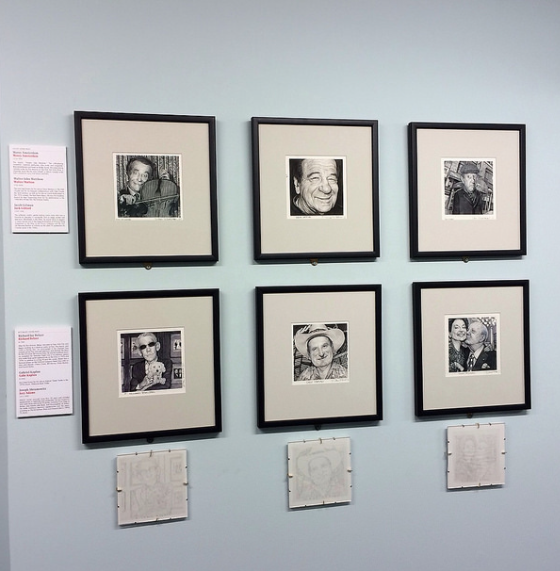 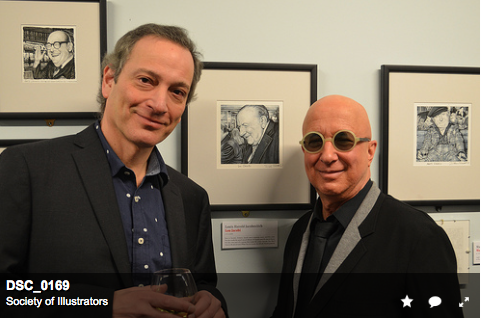 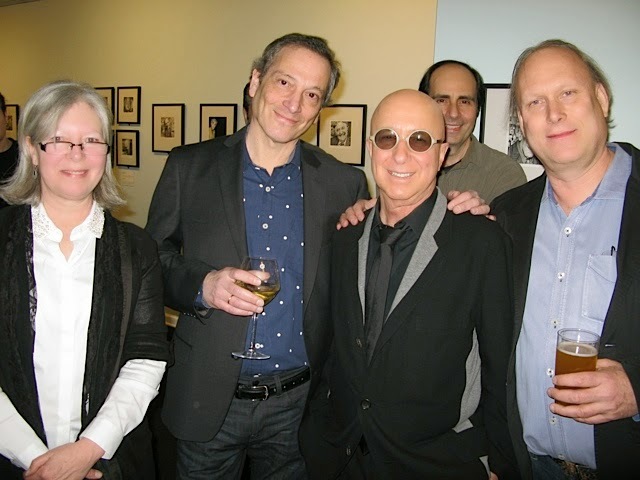 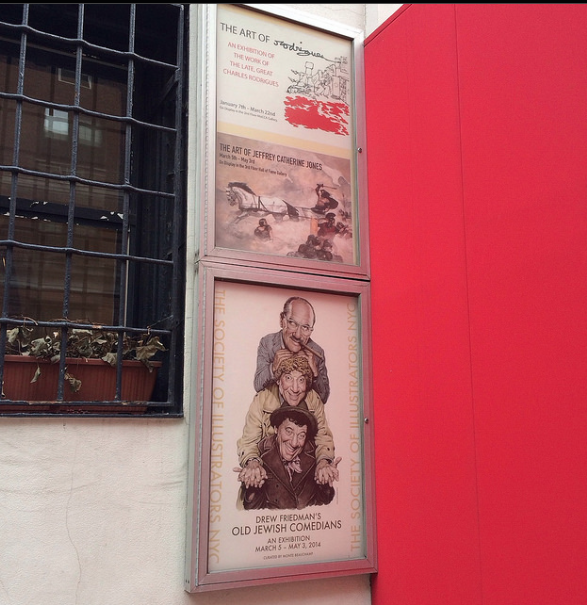 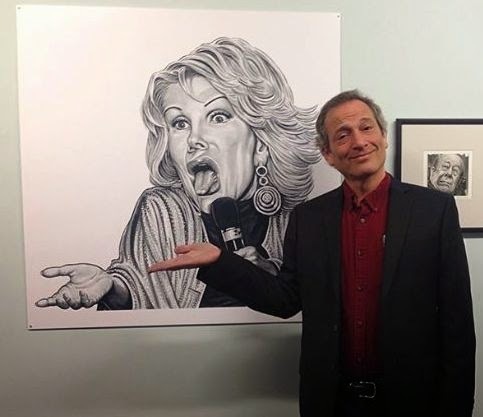 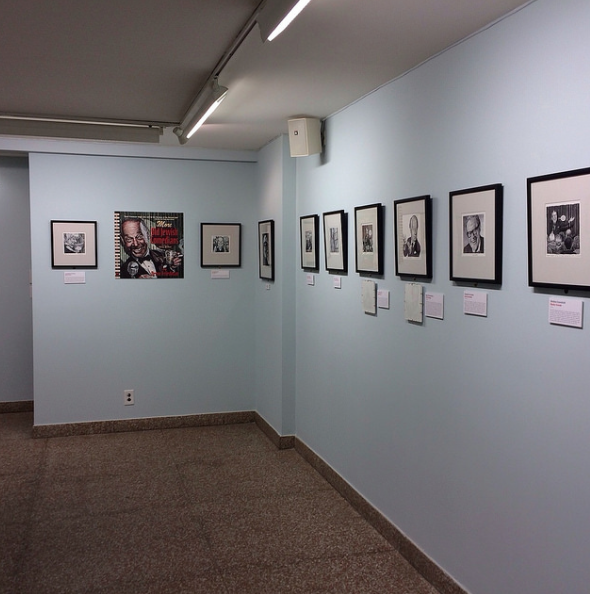 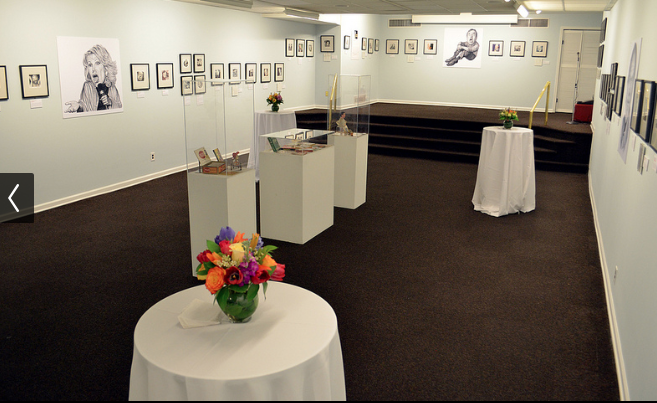 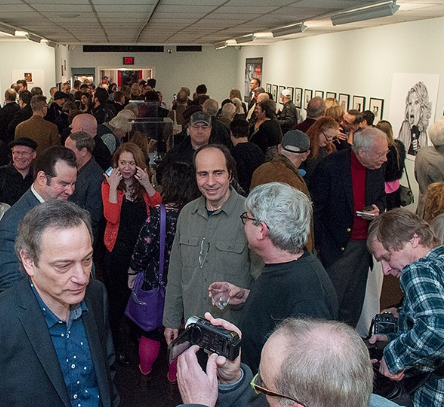 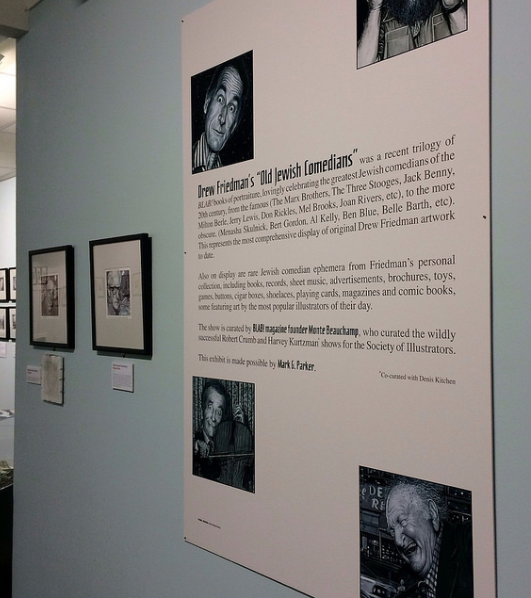 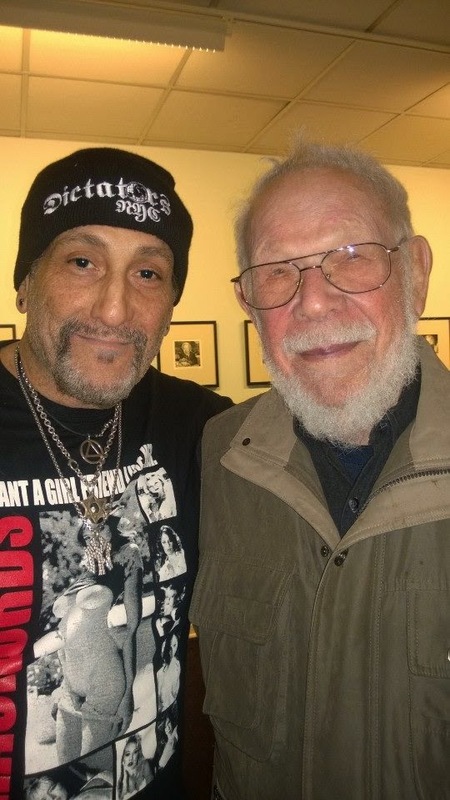 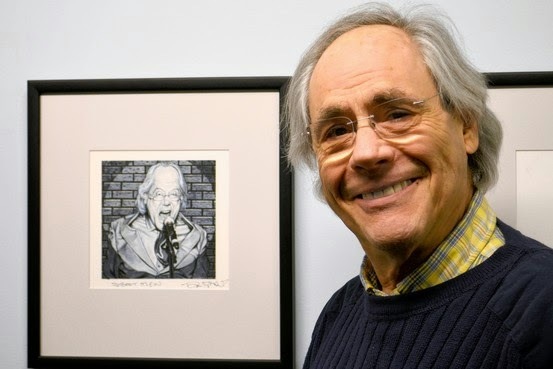 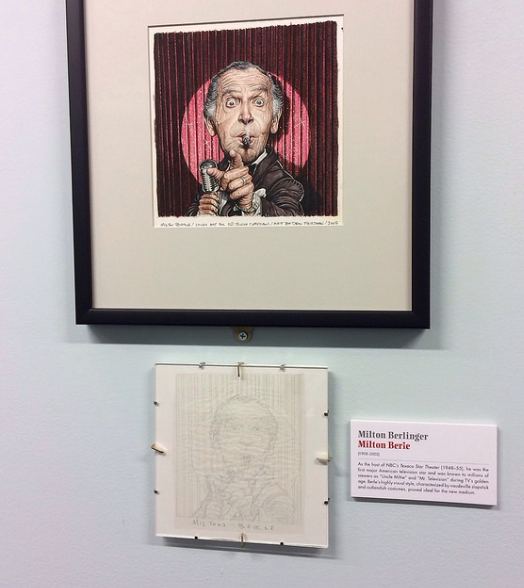 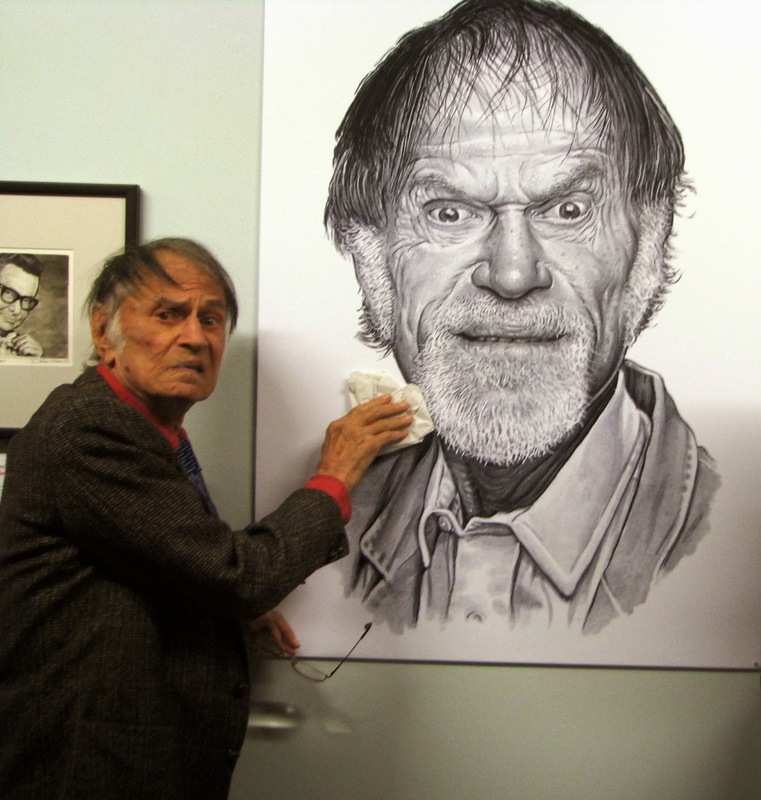 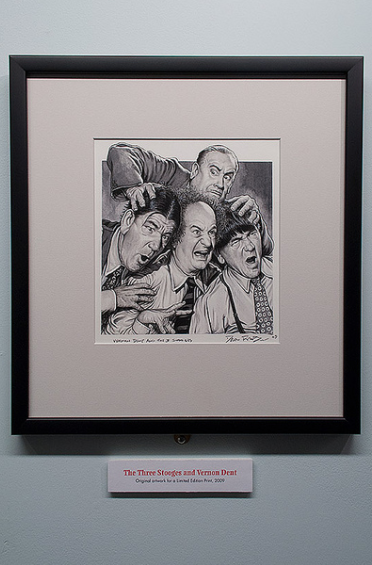 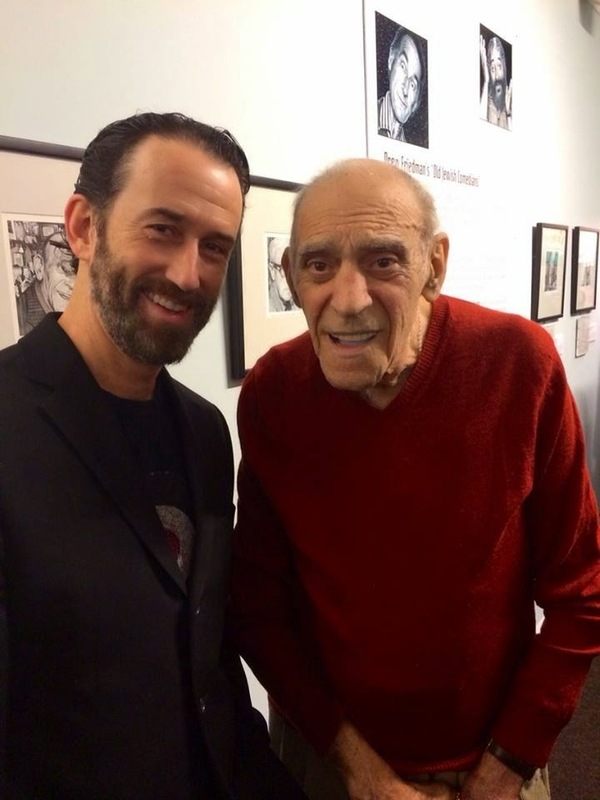 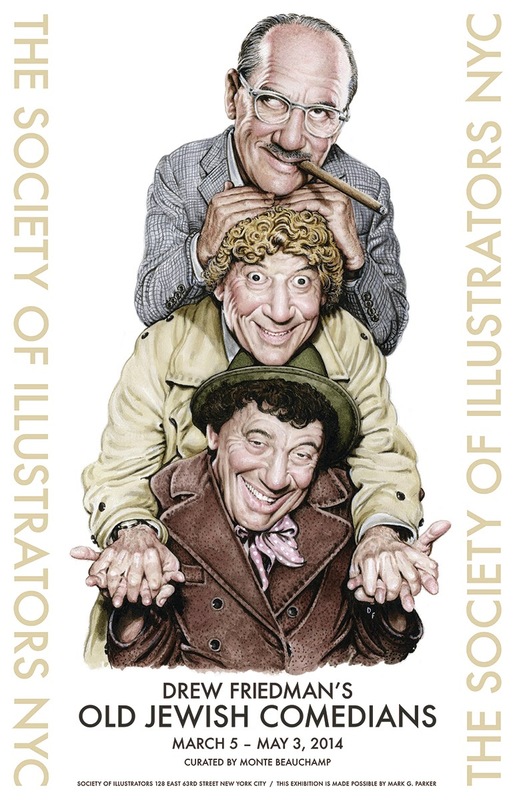 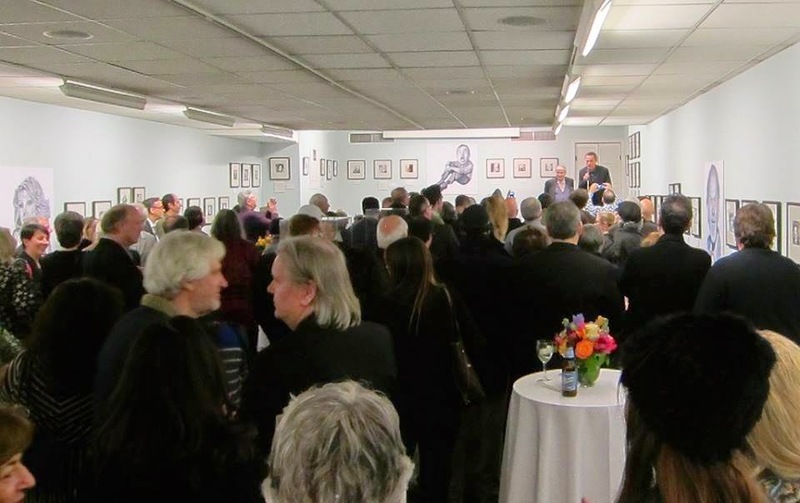 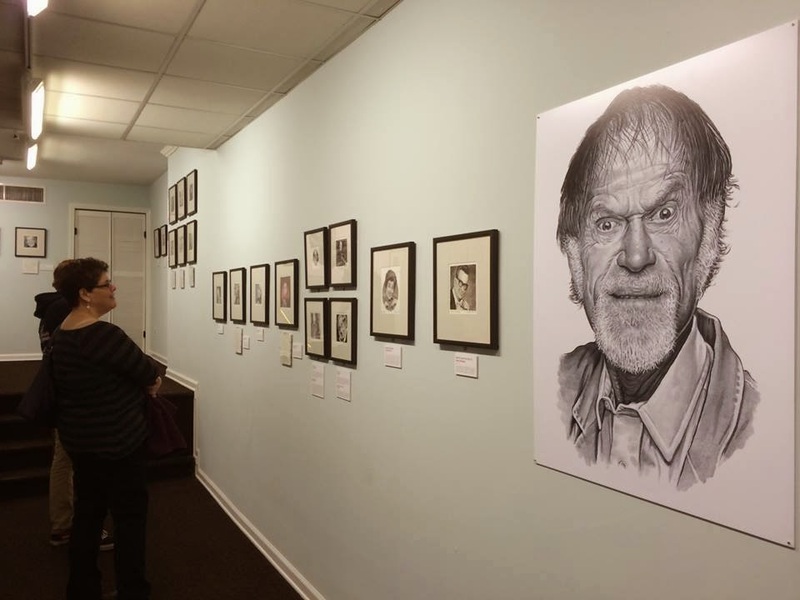 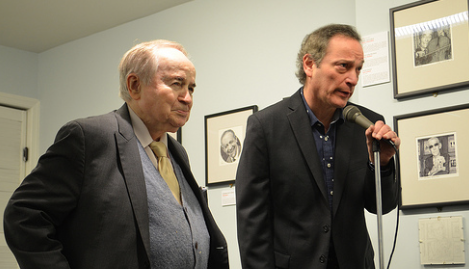 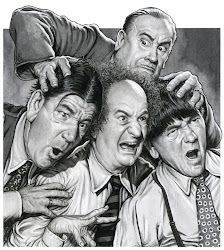 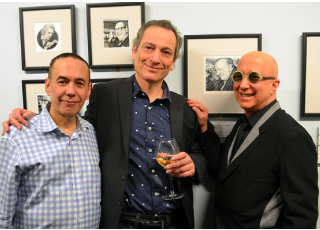 The Society of Illustrators presented a 2-floor gallery showing in their museum of illustration of my "Old Jewish Comedians" artwork, curated by Monte Beauchamp. 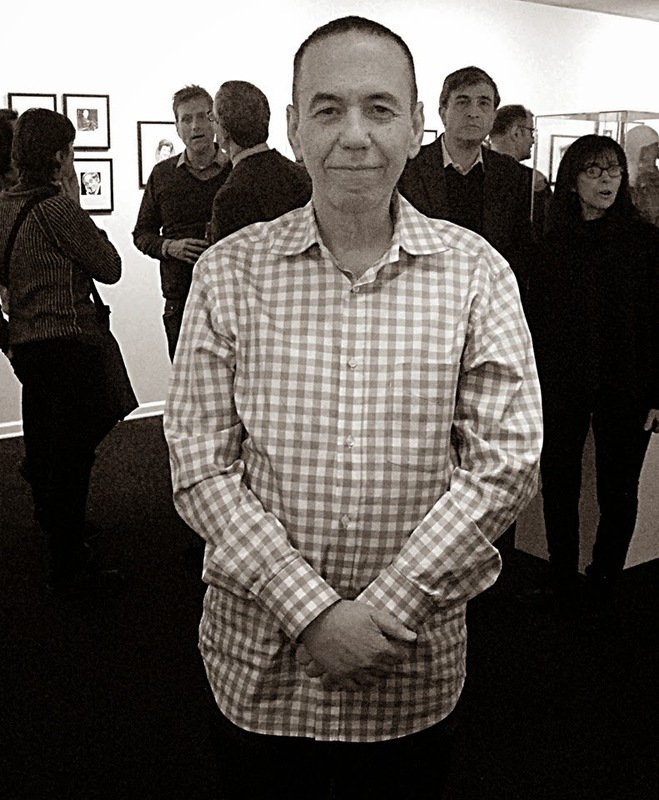 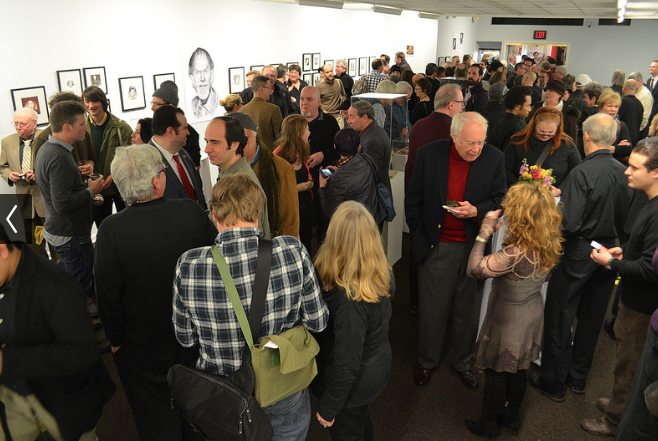 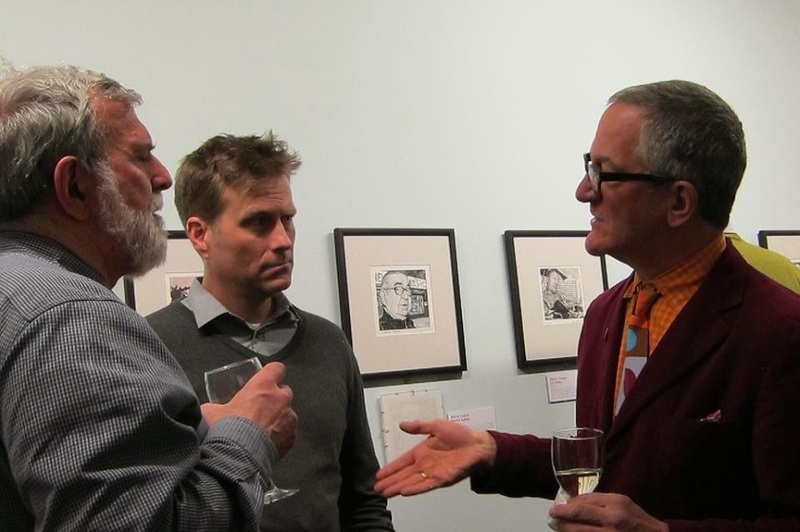 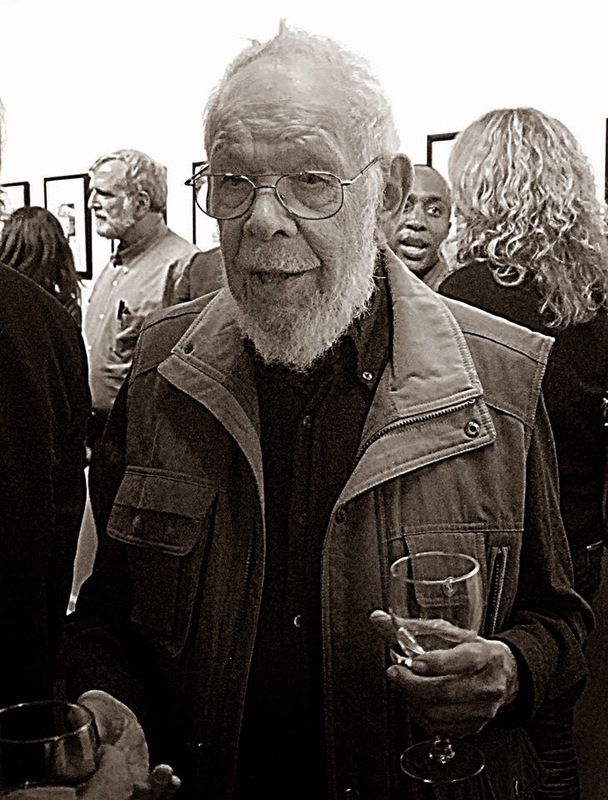 The opening reception was held on March 5th and the show ended May 3rd. 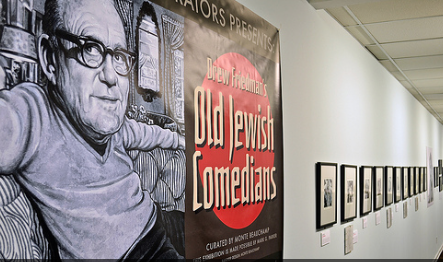 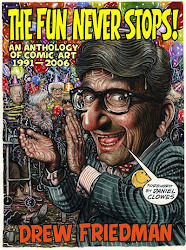 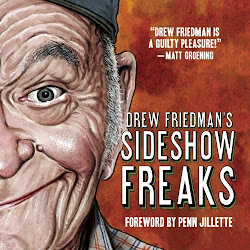 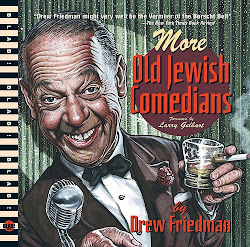 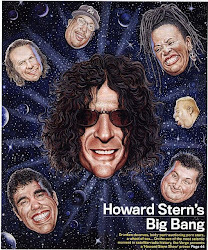 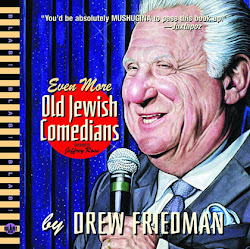 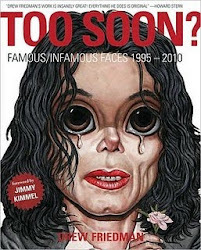 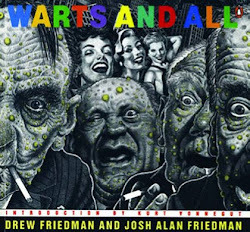 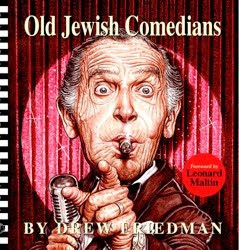 The show featured all of my original artwork from my three OJC books, edited by Beauchamp, as well as early rough sketches and additional Jewish comedian-related artwork created for books, magazines, prints and DVD covers. 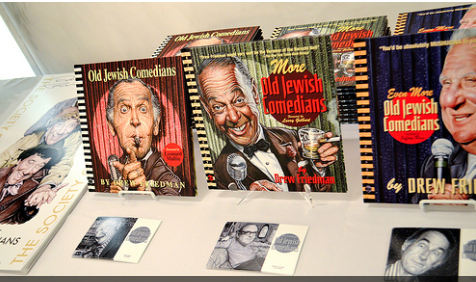 This was the most comprehensive display of my original artwork to date, containing over 115 illustrations, plus biographies of each comedian. 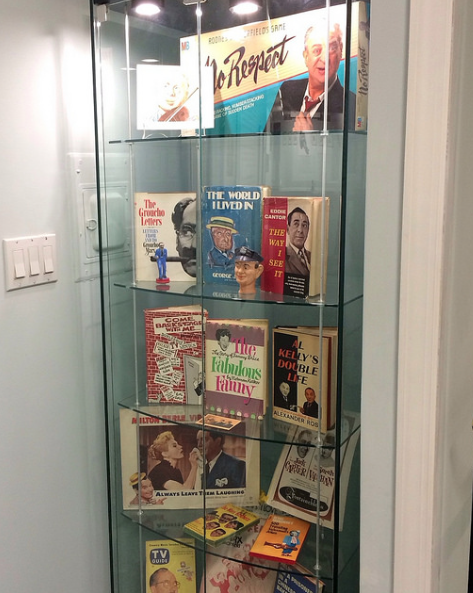 Also on display was over one hundred of pieces of rare comedian ephemera from my collection, books, magazines, comic books, records, sheet music, advertisements, brochures, toys, games, buttons, cigar boxes, shoe laces and playing cards, some featuring art by Al Hirschfeld, Jack Davis and Norman Rockwell. 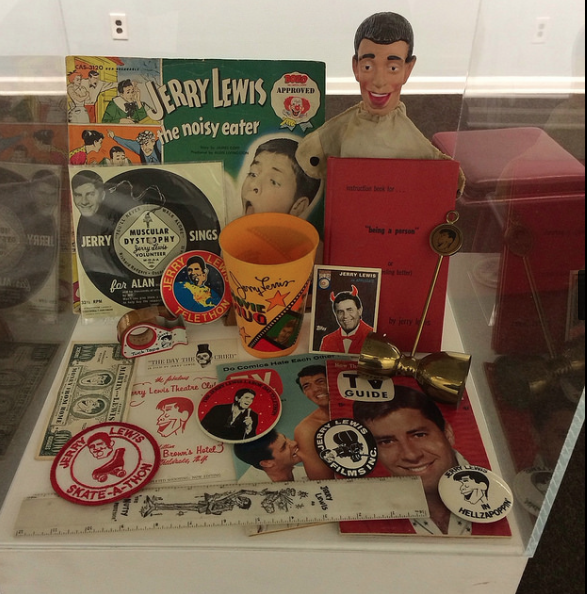 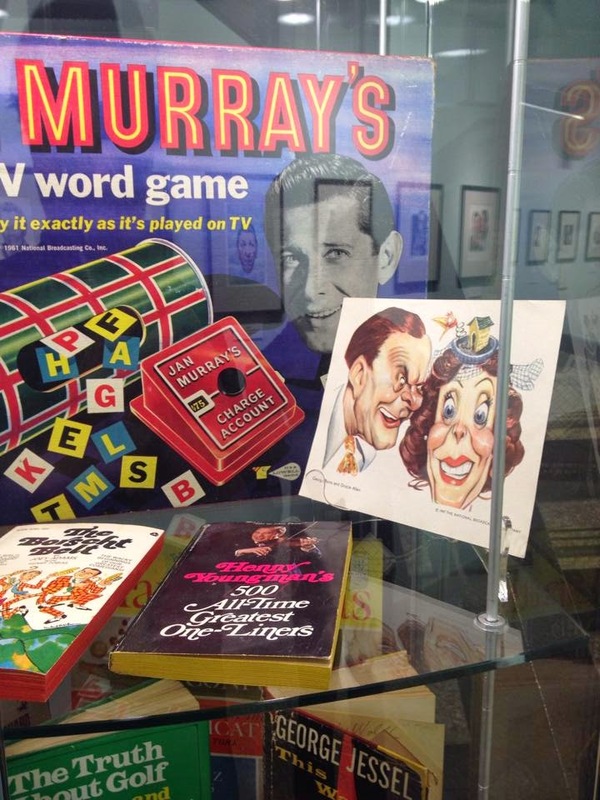 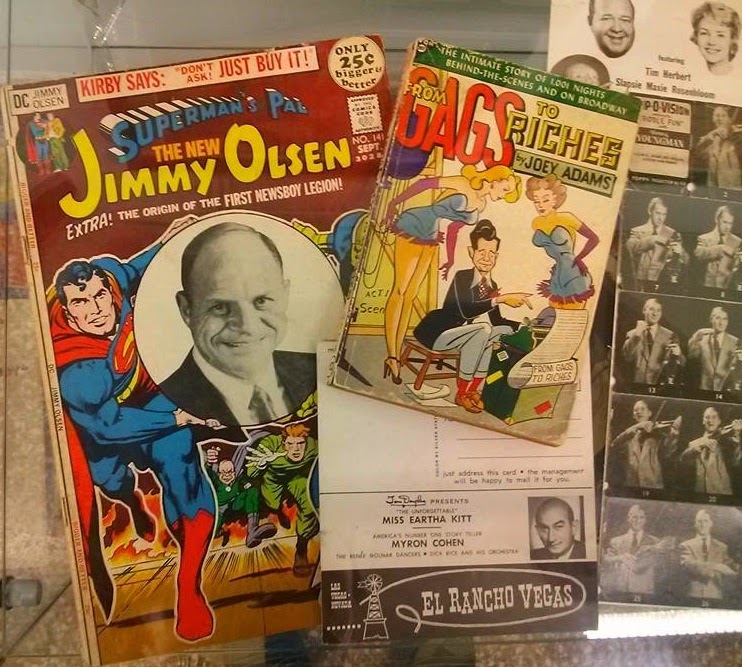 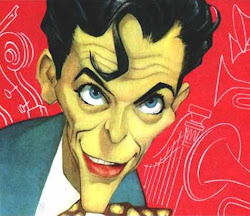 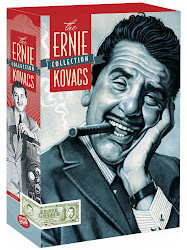 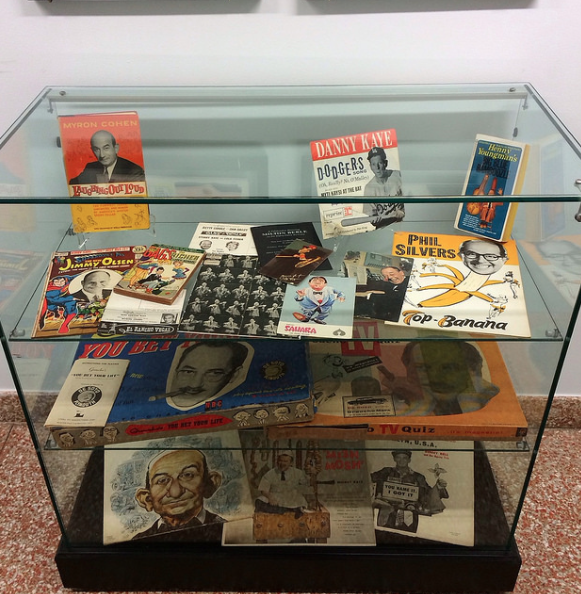 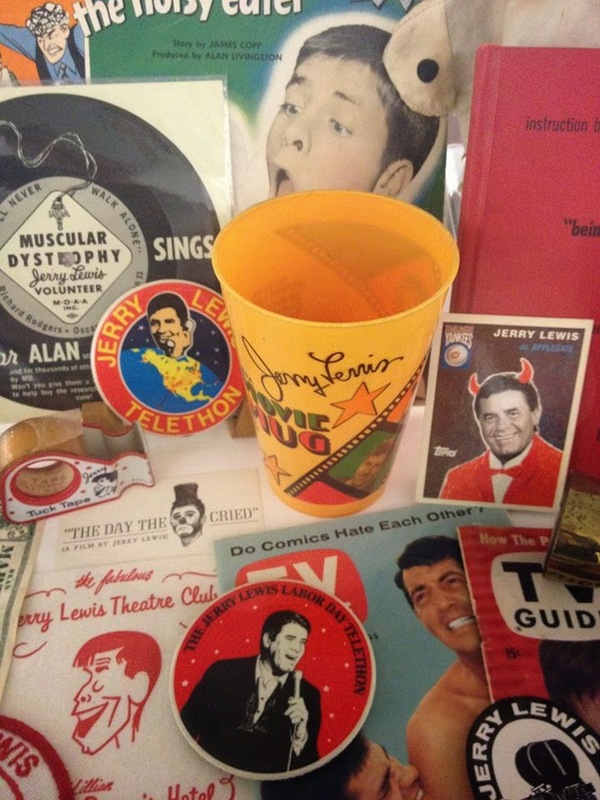 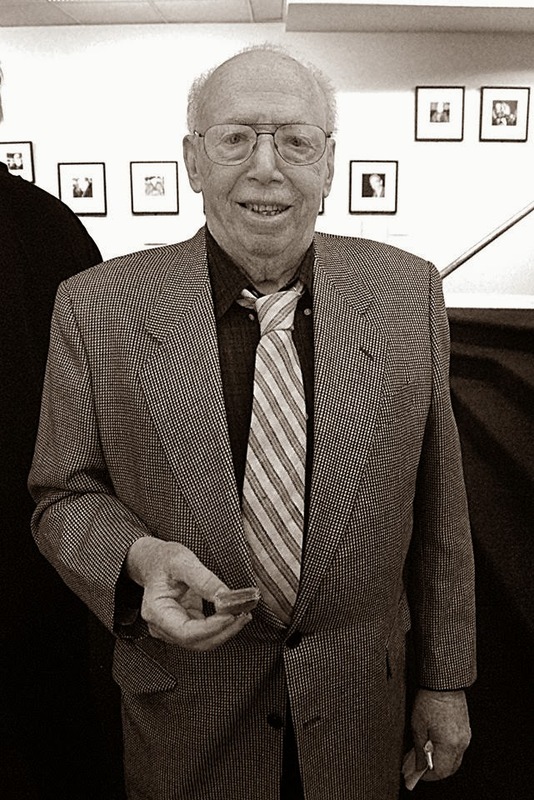 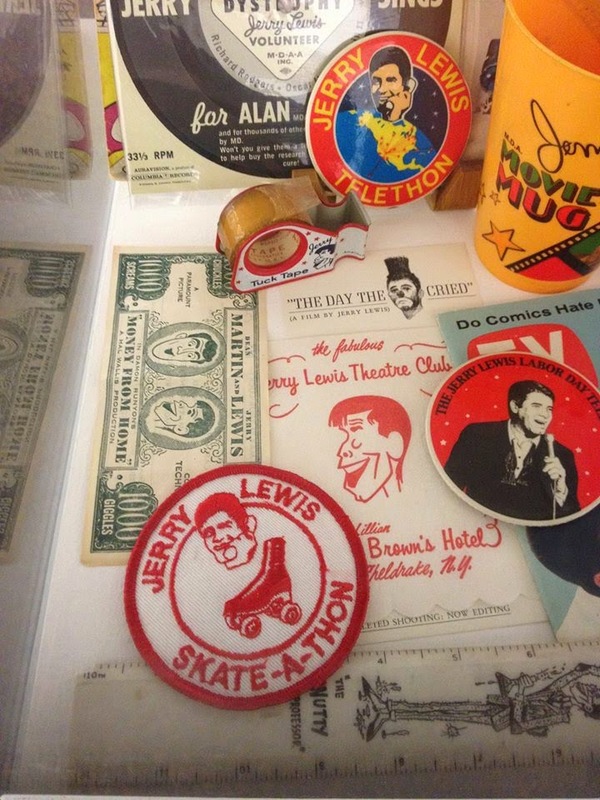 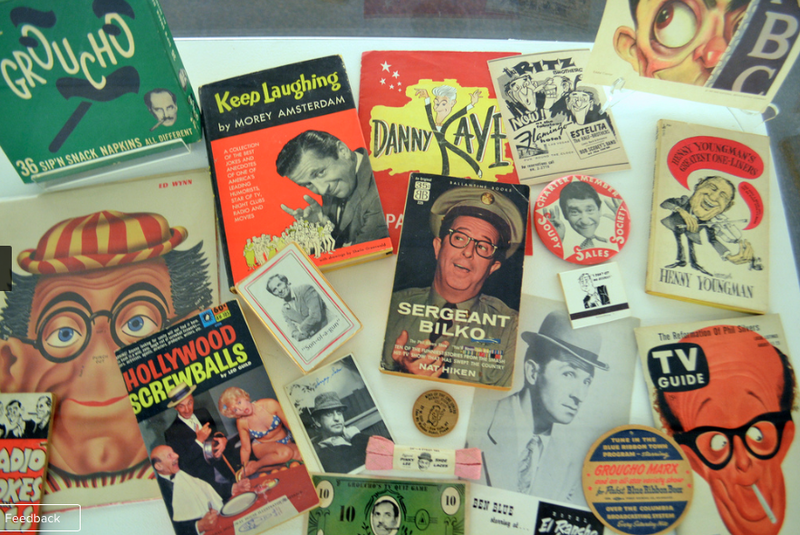 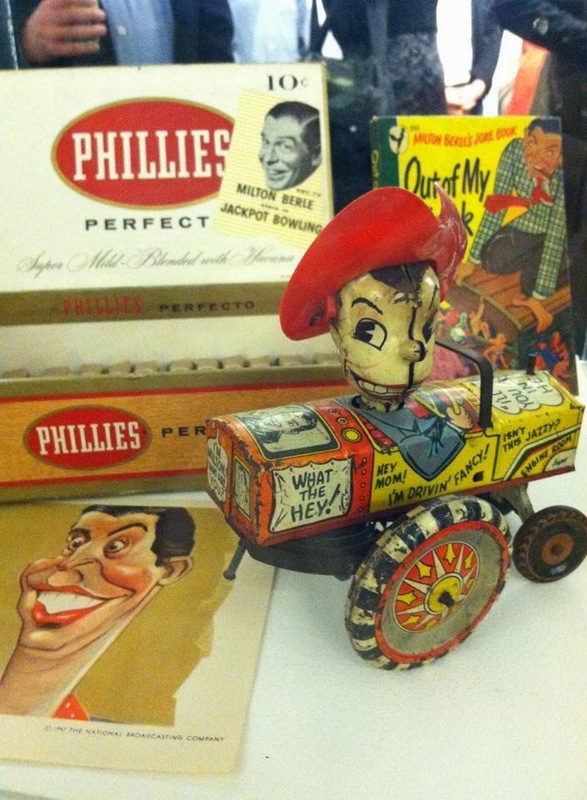 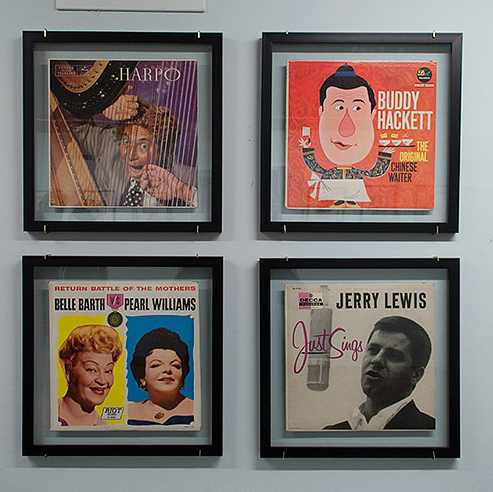 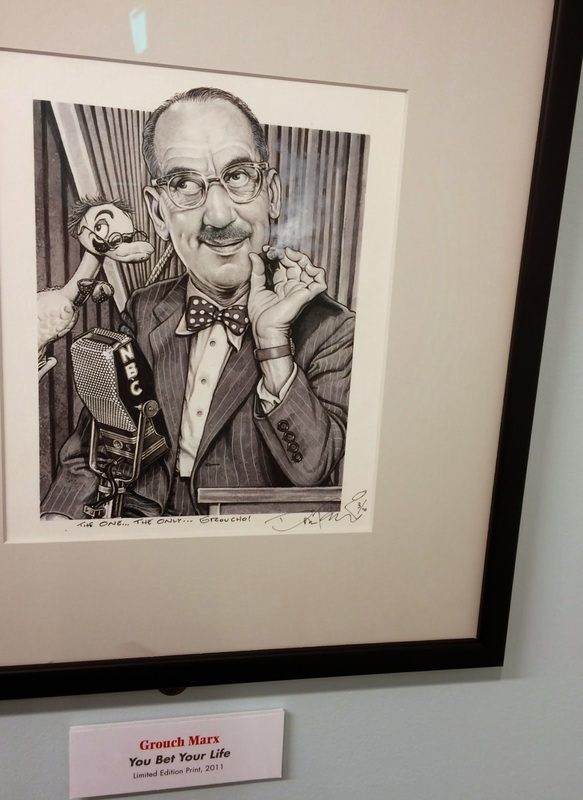 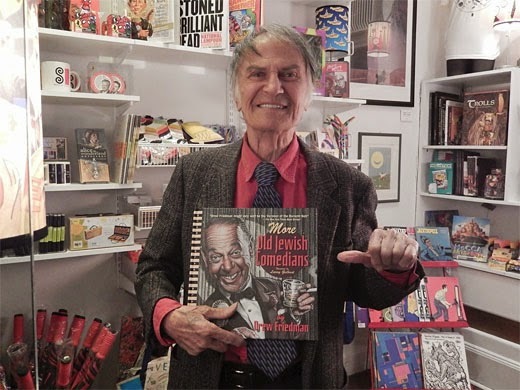 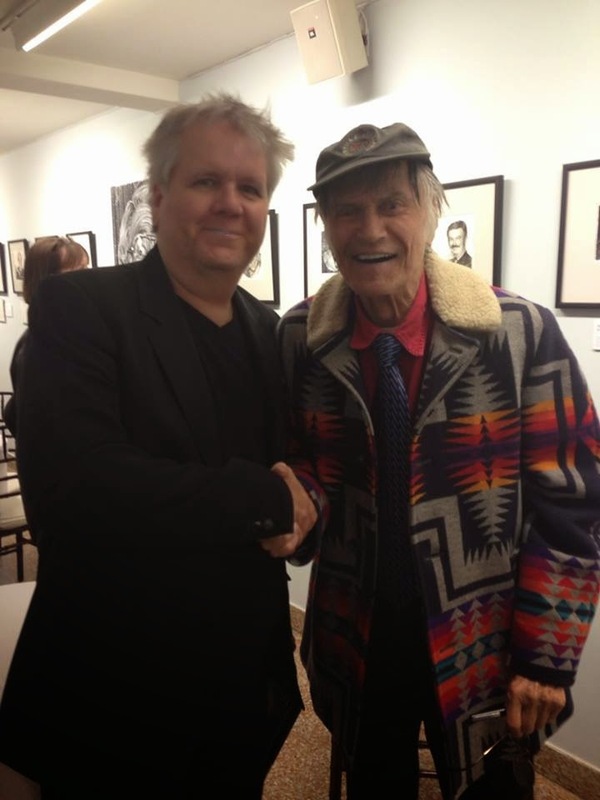 Illustrator Stephen Kroninger loaned many rare Jerry Lewis pieces from his collection for the "Jerry Lewis shrine" and Ben Fentington loaned several OJC comedy records for display. 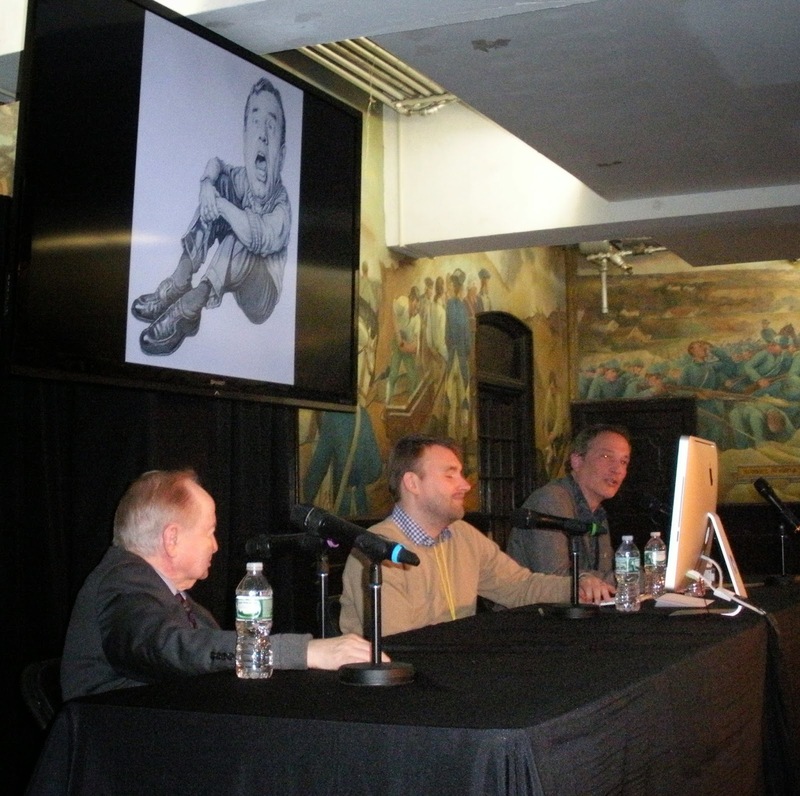 The following is a photographic recap of the show, the opening reception, and the two panels held in conjunction with the show, the first at the MoCCA arts festival with Joe Franklin, the second "From the Borscht Belt to Seinfeld" at the Society of Illustrators on E. 63rd St, moderated by Dr. Eddy Portnoy and featuring myself, famed comic Larry Storch and writers Bill Persky and Tom Leopold. 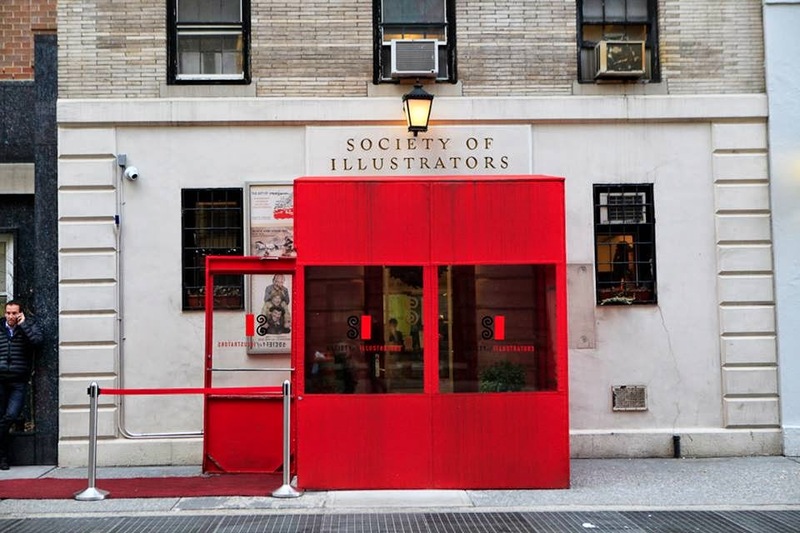 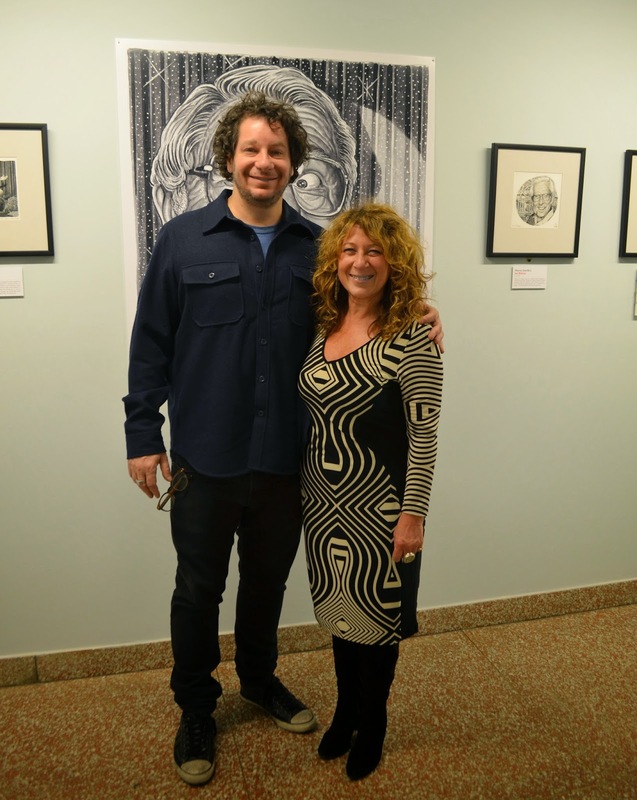 Special thanks to Mark G. Parker, Monte Beauchamp and Anelle Miller and the entire staff of the Society of illustrators for making this show happen. 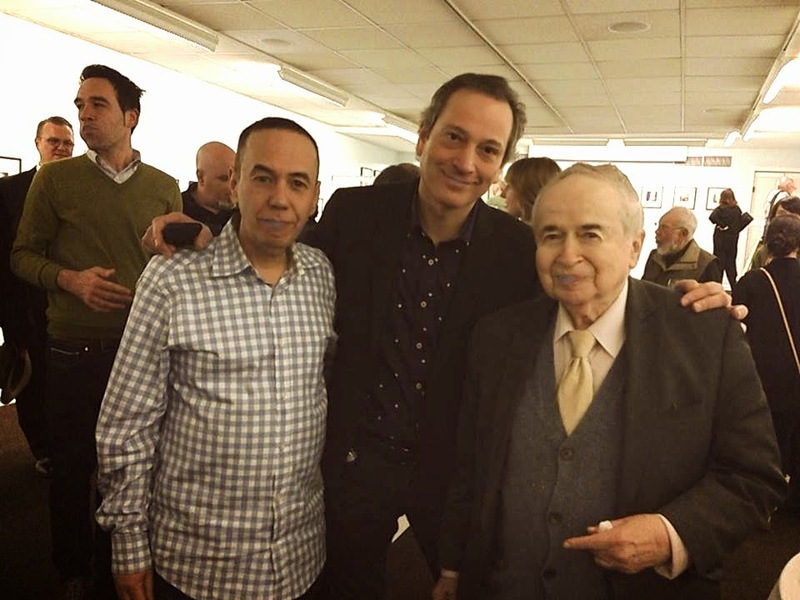 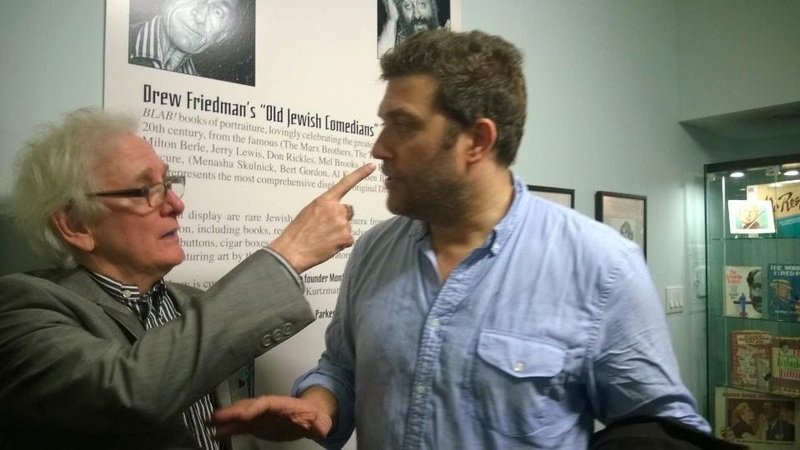 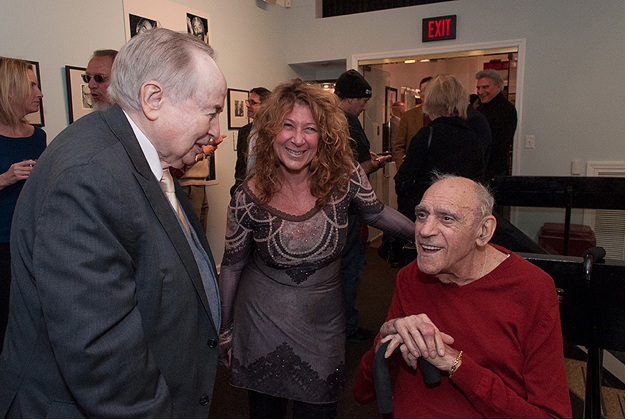 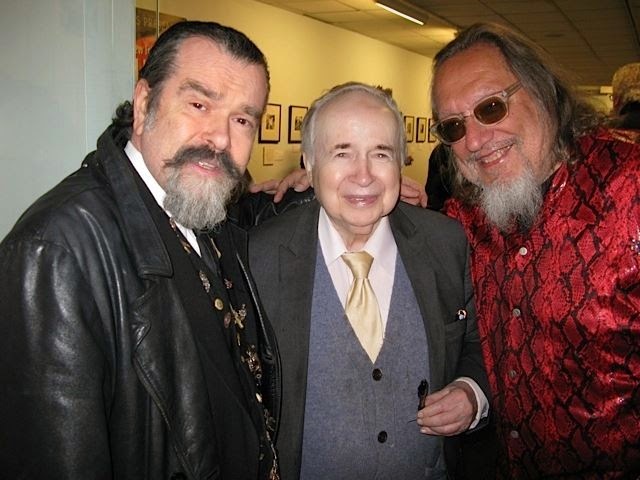 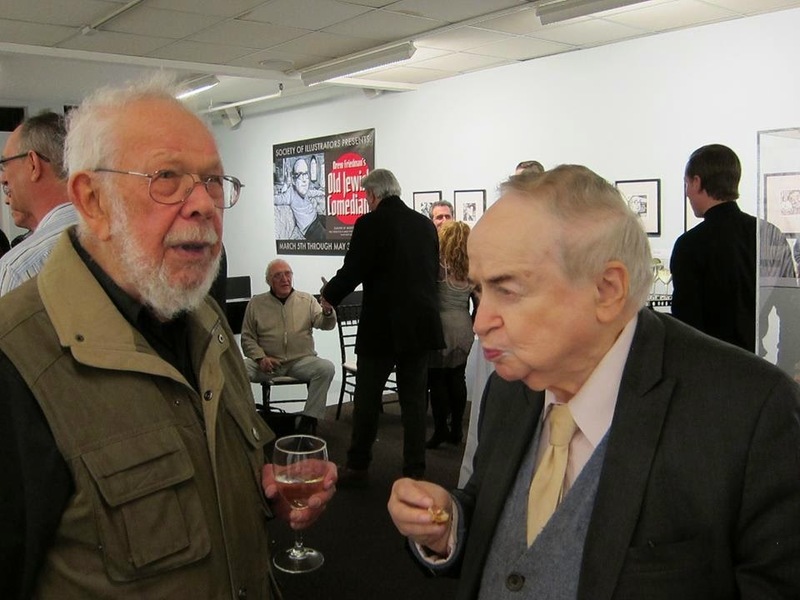 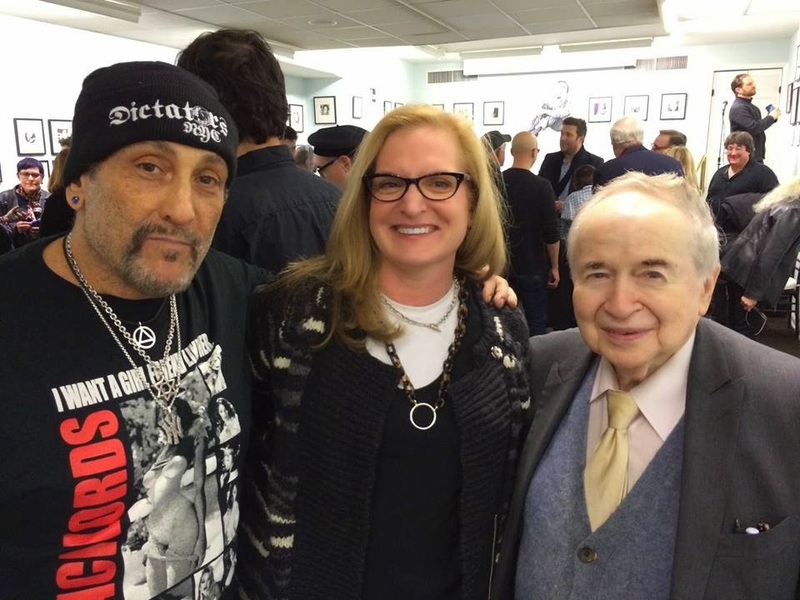 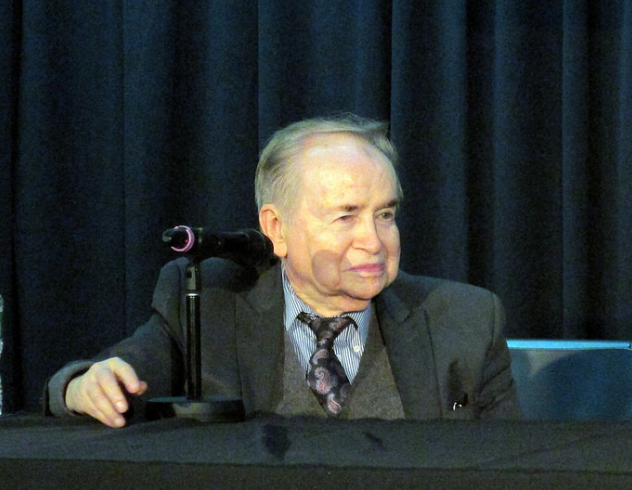 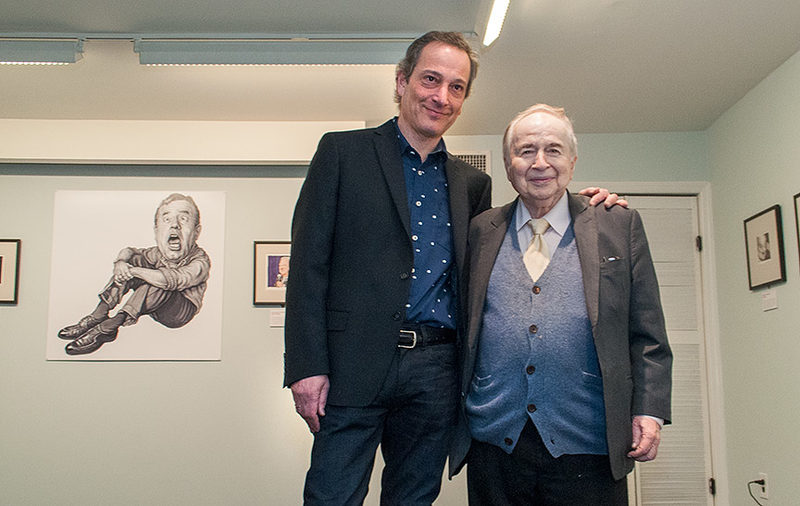 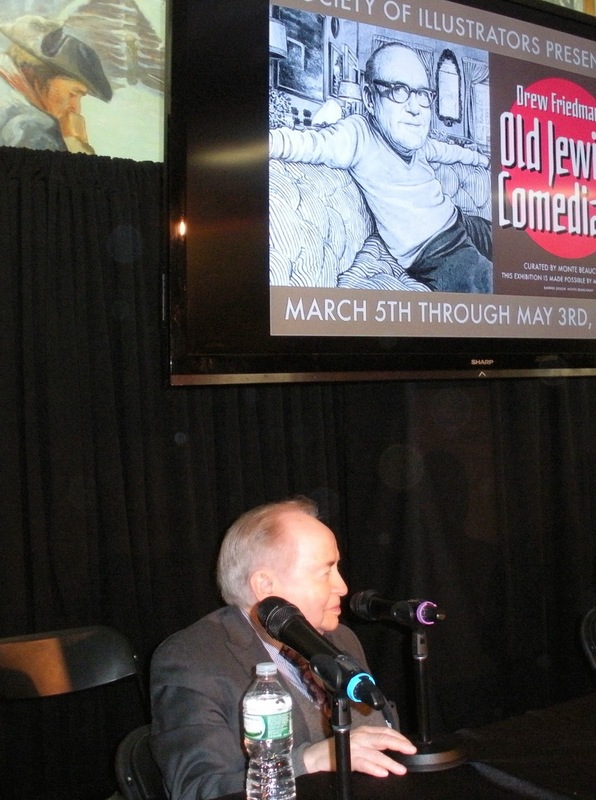 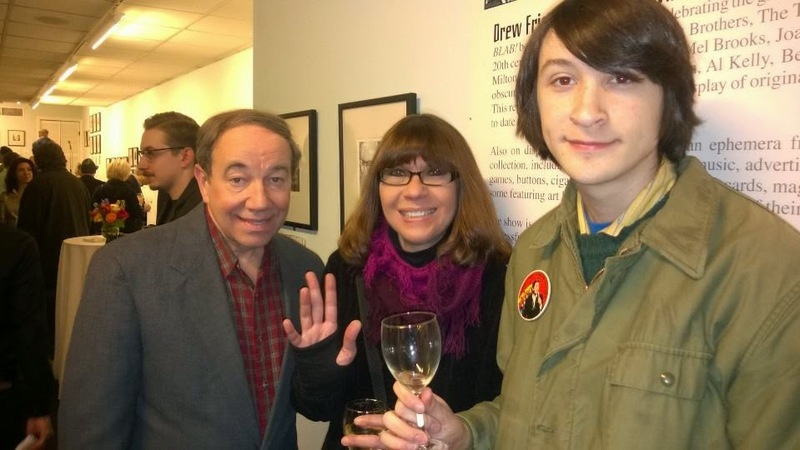 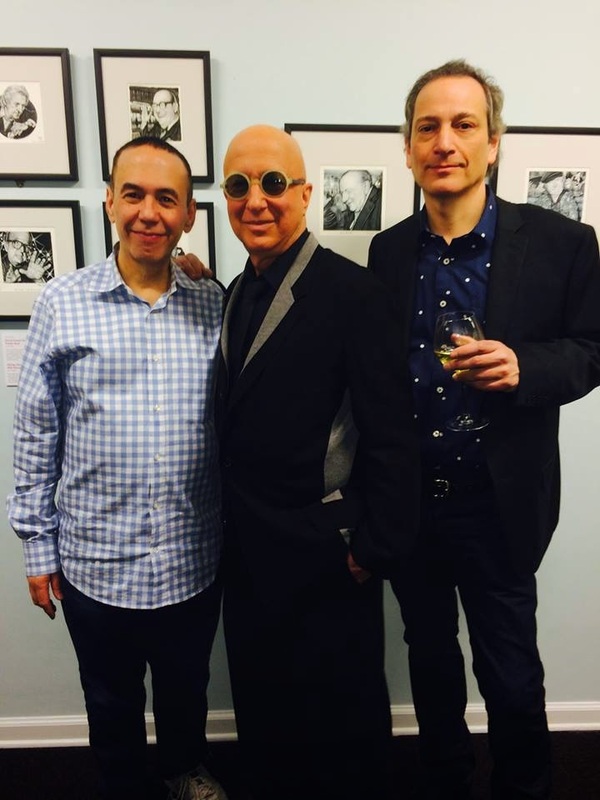 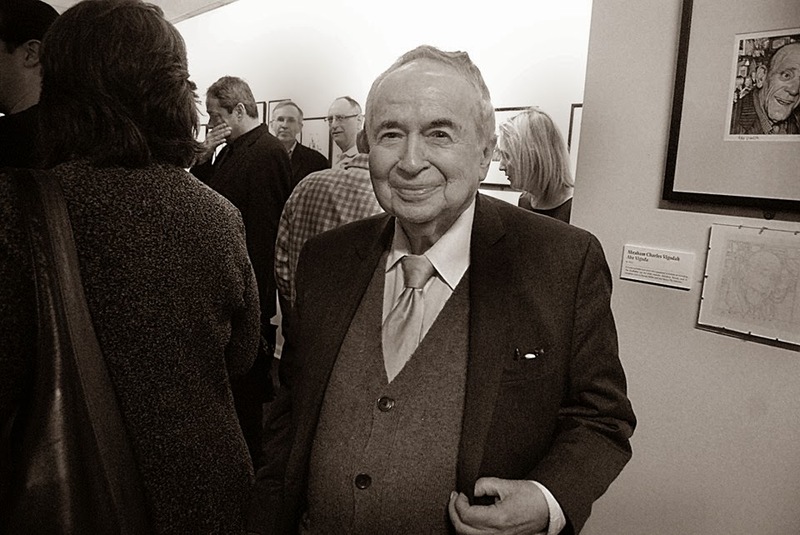 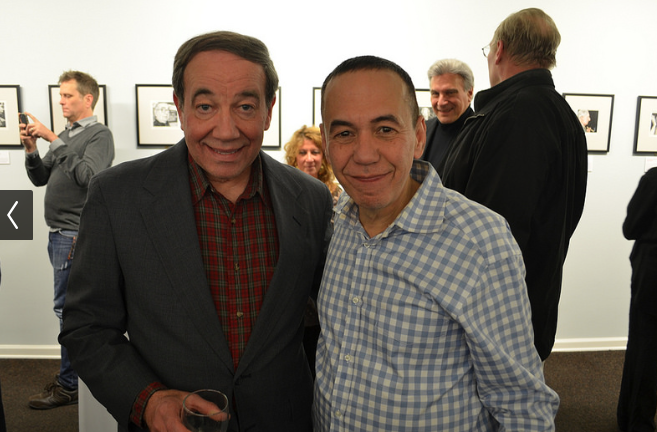 On April 10th, As part of the MoCCA Arts Fest at the Lexington Ave Armory, and in conjunction with the OJC show, legendary talk show host Joe Franklin and I held a panel to discuss everything Old Jewish Comedians. 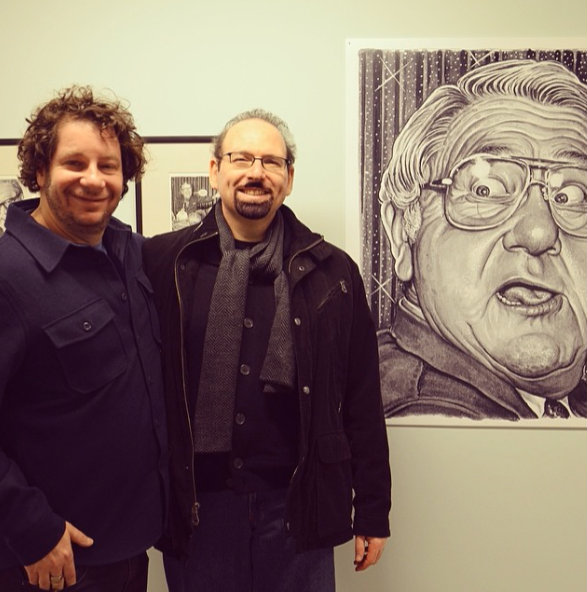 I also gave a visual preview of my upcoming book "Heroes of the Comics". 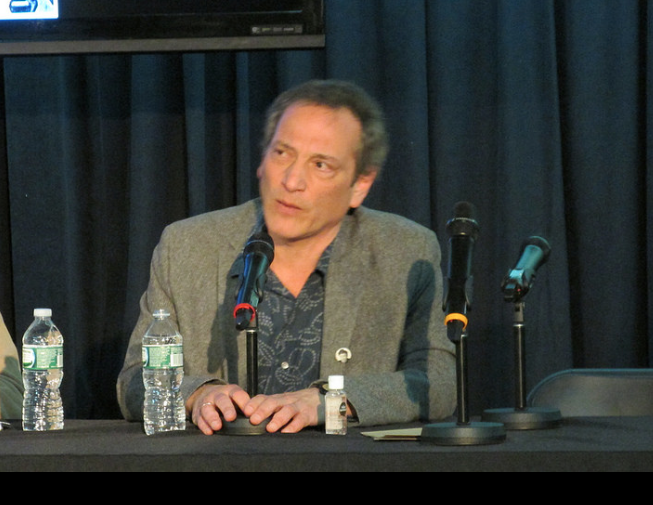 The panel was filmed and will posted here soon. 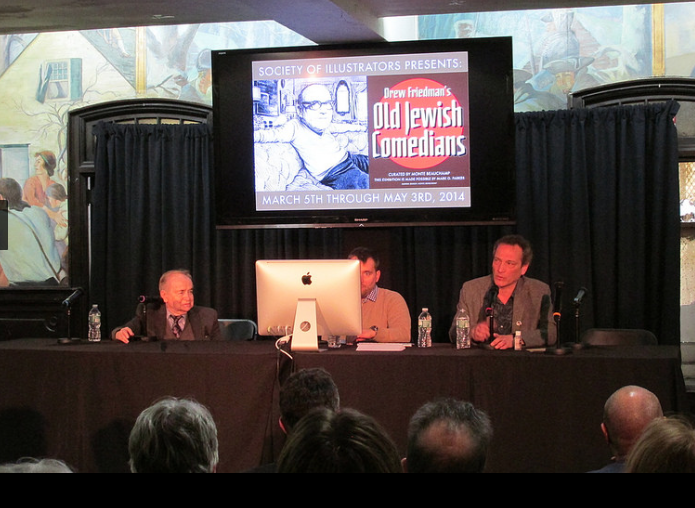 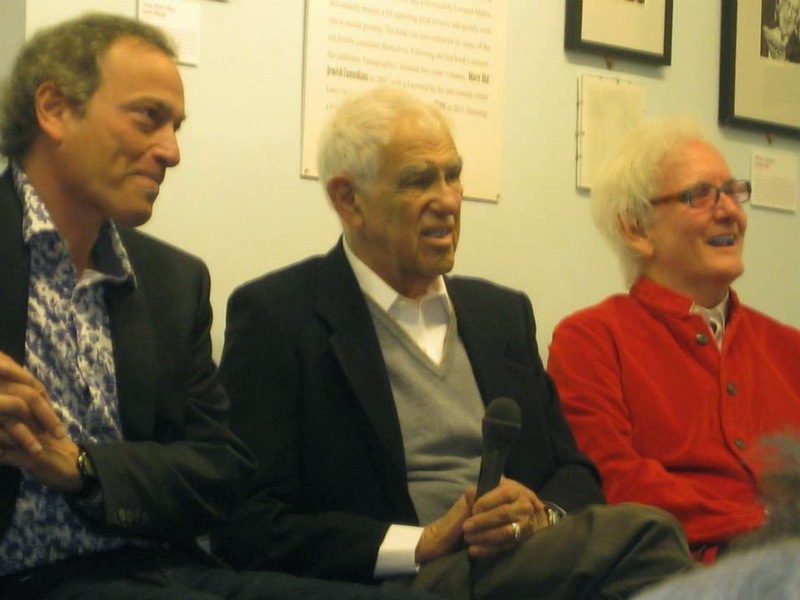 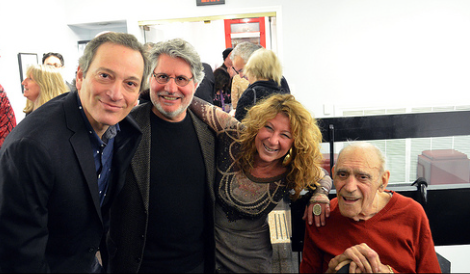 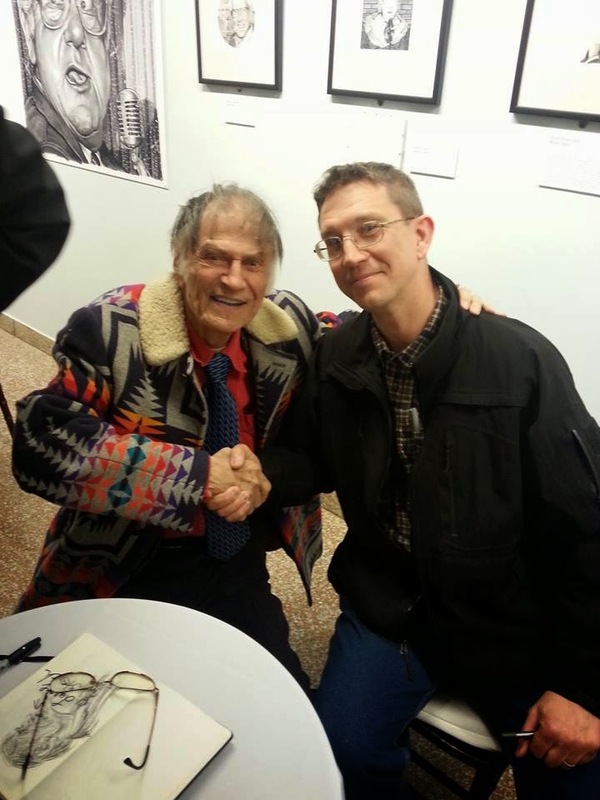 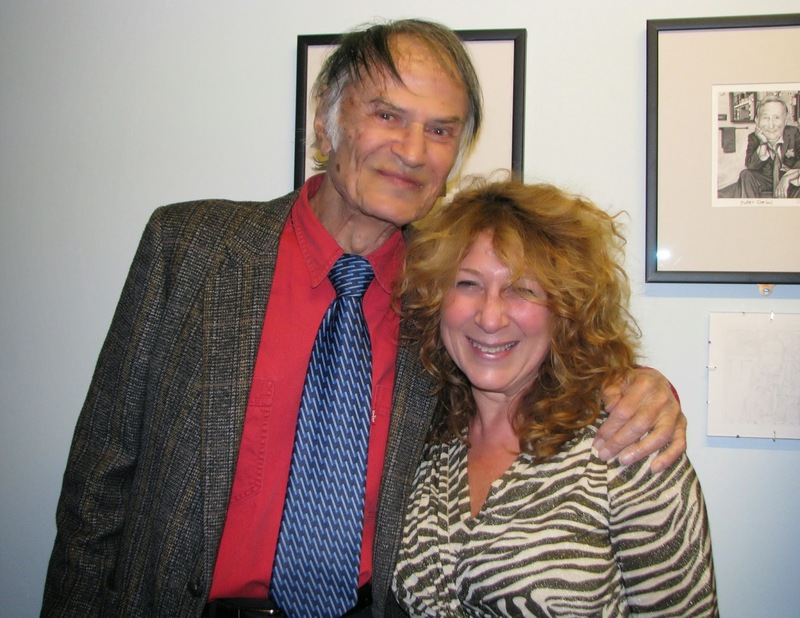 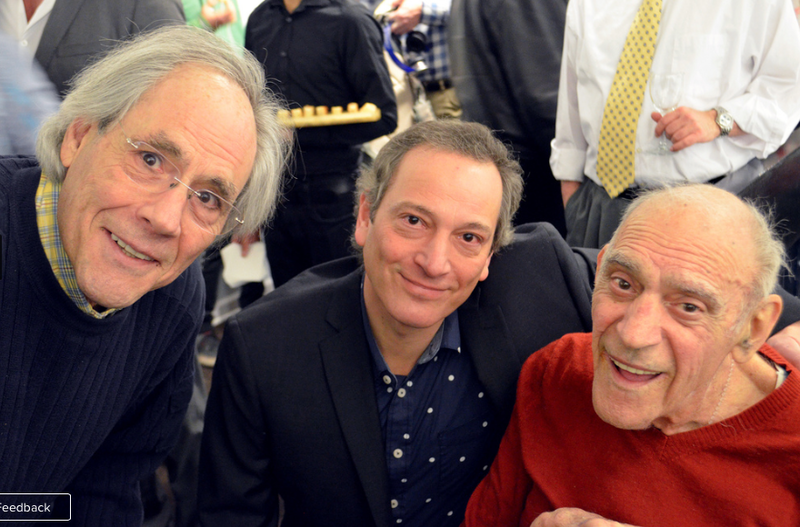 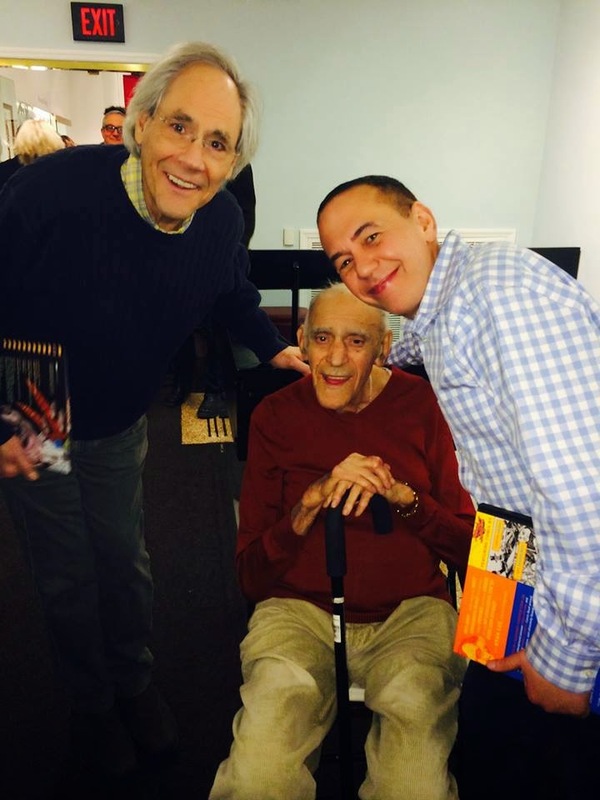 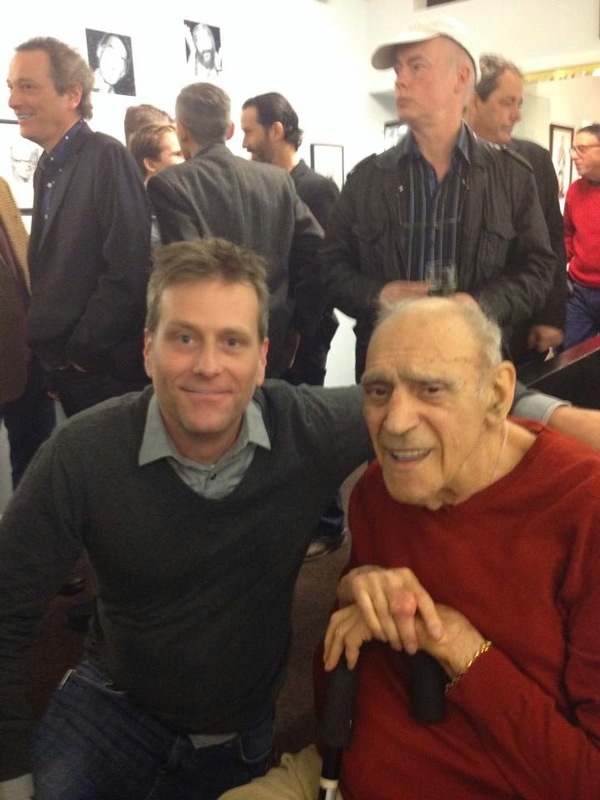 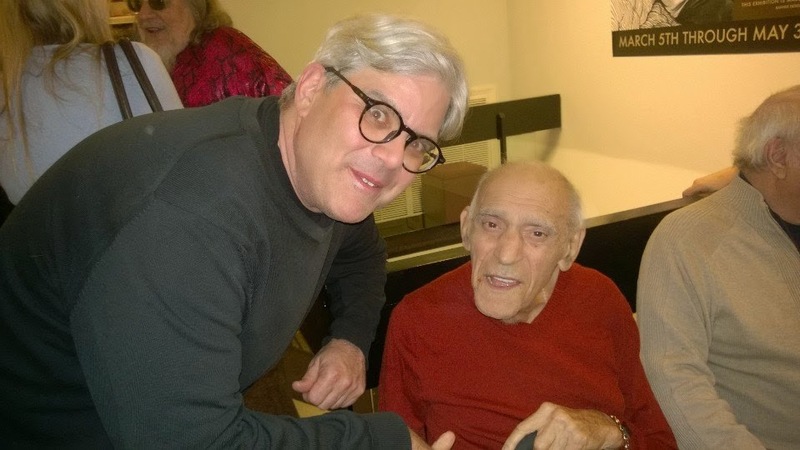 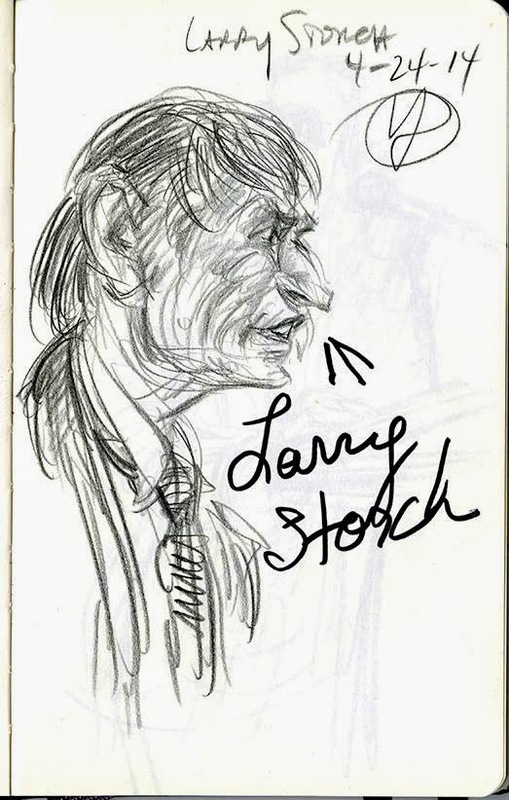 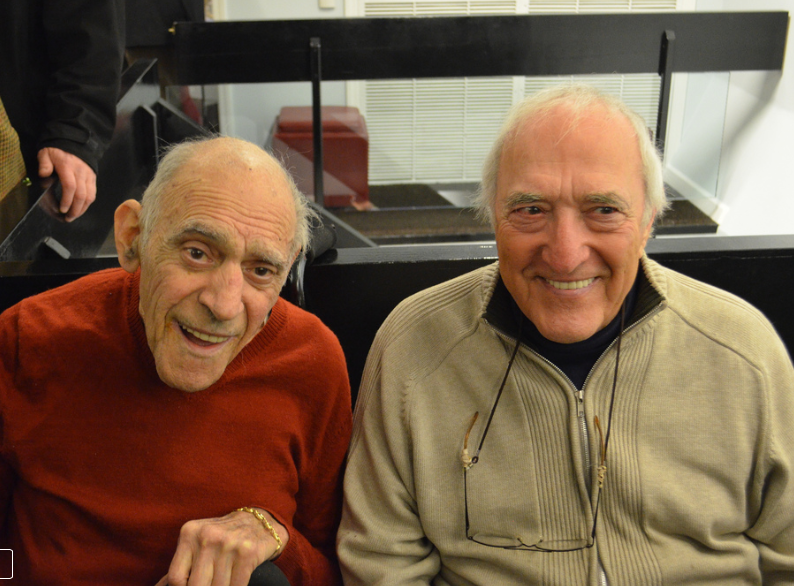 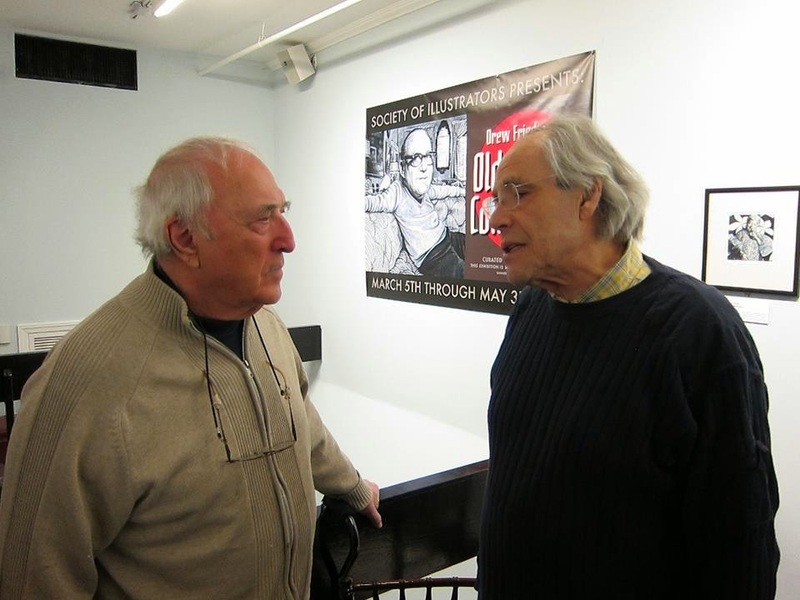 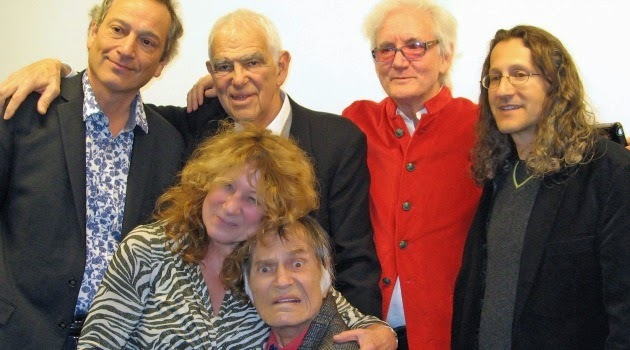 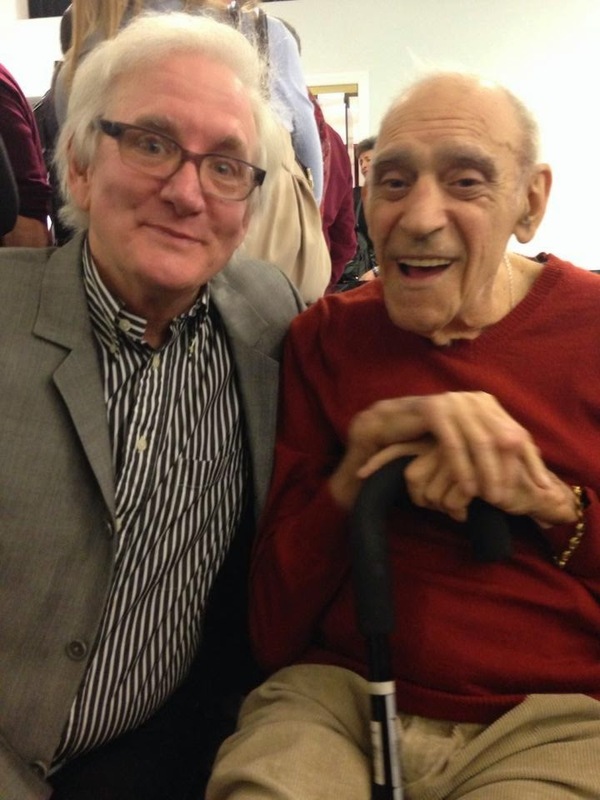 On April 24th, The Society of Illustrators hosted a panel to coincide with the show, "From the Borscht Belt to Seinfeld, the evolution of Jewish Comedy", moderated by Yiddish theatre scholar/P.hd Dr. Eddy Portnoy, and featuring comedy legend Larry Storch, famed comedy writers Bill Persky and Tom Leopold, and myself. 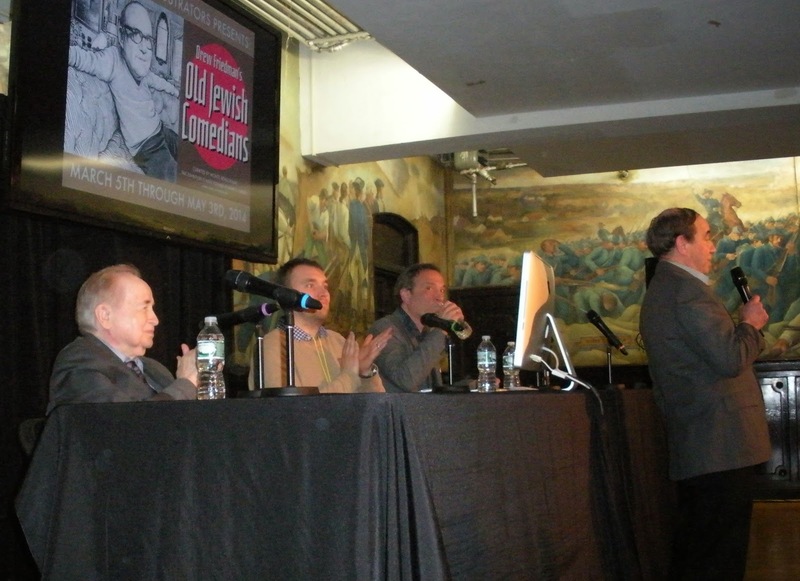 The sold-out SRO panel was made possible by a grant from the New York Dept of Humanities.